You are looking for a relaxing, light-filled setting to have a delicious meal. You want a server who immediately understands your dietary lifestyle and offers suggestions from the menu with an expression of “no worries” and a smile that says “you belong here”. 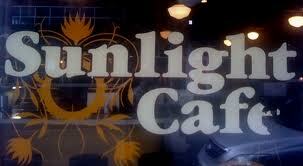 The Sunlight Cafe is my home-away-from-home for food in north Seattle. 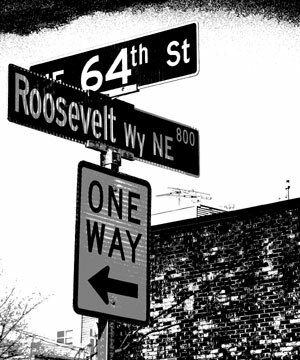 The existence of this food oasis is probably not news to anyone in living in Seattle, since they’ve served the vegan/vegetarian community here for many years. Maybe this will just be a happy reminder if you haven’t been there in a while. For those of us who are looking for no-fat vegan eats, these guys are already there with us. They actually have items on the regular menu that fit beautifully. Try the Brown Rice Salad and make your own honey-balsamic dressing at the table or ask them to mix it in the kitchen. The Steamed Vegetables with Tofu is also good, and the nice garlic-ginger sauce is fat-free. The Sunlight is open from 9:00 a.m. to 9:00 p.m. everyday. Love it! OK, no-fat vegans….it is a hot summer day in the Kingston-to-Edmonds ferry line. Smell the salt air, feel the warmth on your bare feet, share the wait with a hundred other families buzzing with their children, their dogs and their ice cream cones. It is a quintessential Seattle experience. Dang…I’m facing my first ferry line ever without the ice cream cone. Fortunately, I discovered Mora Iced Creamery this week; a Kitsap county company with 3 stores: Poulsbo, Bainbridge and (yay)…Kingston! Mora has all kinds of iced cream deliciousness going on. They make everything from scratch in small batches and tout unique flavors beyond your imagining, including goat cheese with fig, rose petal, and lemon bar. The staff was knowledgeable and so helpful! I explained that I am vegan, and eat no fat, and could they fix me up in their ice cream shop with something refreshing? They didn’t miss a beat! 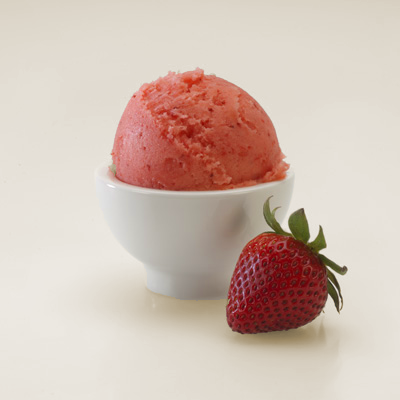 They quickly pointed out all the sorbet flavors and suggested a watermelon sorbet smoothie. Not only does this solve my ice cream-in-ferry line crisis, it suggests a new destination for date night. If you live in Seattle, there is a new foot passenger ferry to Kingston from Pier 50, or you can drive to Edmonds and walk on to the regular ferry for that wonderful summer ride across Puget Sound. Strolling with my family through Bellingham’s old Fairhaven district on a warm Sunday morning landed us in an Orleans-esque alley filled with charm and a secret destination: Skylark’s Hidden Cafe. Being noon, we readily grabbed the first table and I quickly realized that there was not much on the menu that fit the no-fat vegan formula. Plan B: talk to the server! 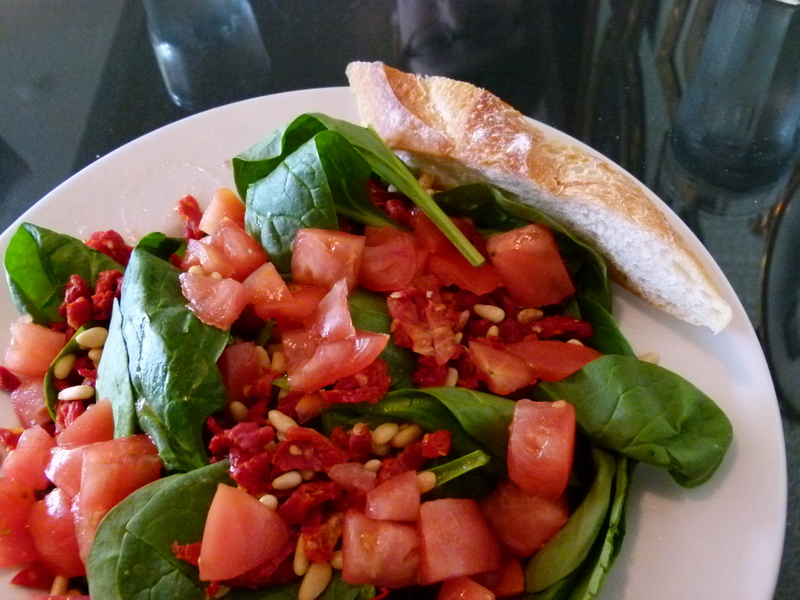 She was a gluten-free gal, so completely on board with my “special needs” and had the kitchen whip up a large and delicious spinach salad – fresh baby spinach and chopped tomatoes, sun-dried tomatoes, a sprinkle of pine nuts (not normally on the Esselstyn diet, but I requested) and balsamic vinegar on the side. We got very nice service, a charming in and outdoor setting, with a fair amount of garden and alley seating. There is also a pretty main dining area upstairs and street level access. The menu for a no-fat vegan was very limited, but the spirit in the place was good, and they will do their best to make you something if you direct.